Splintered/Unhinged flip ARC by Anita Howard: 250+ Book Giveaway! I like the Alice in Wonderland spin. Loved The Looking Glass Wars. I like the idea of it being based on a fairy tale. It looks like it will be a very interesting read. I love the idea of an Alice and Wonderland retelling and I've heard good things. I haven't read either book so the two in one has appeal. First of all, I like anything Alice and Wonderland, but it has always been a little juvenile. This is more like an Alice and Wonderland for adults. Such a creative idea. I love twisted takes on classics! This is such a nice giveaway! I love the covers so much... look like something my friend would draw! I love the fact that it's a retelling of Alice in Wonderland! It's one of my all time favorite fairy tales. I love the Alice in Wonderland aspect of the book. I read Splintered and devoured quickly. The story was amazing. I just love the covers as well. Im not gonna lie, its totally the cover art that grabbed my attention! Aside from that the story sounds really good too. I like different takes on classics! I agree - it's the Alice in Wonderland connection that fascinates. I've heard so many great things about it, and it's an Alice and Wonderland retelling! The gorgeous covers don't hurt, but mostly it's the Alice in Wonderland theme. And the flip edition is the one I want. Not even sure if you can buy that one though...so I hope I win! I like the cover(s). I also love that it has both books in 1 volume. I like books based on fairy tales, so these sound like a lot of fun to read! My main reason for wanting to read this book is that is a retelling and it sounds good!!! I have also heard a lot of good things about people enjoying the book!!!! Really amazing when books take a different approach to fairy tails! Loved the flipped version! These books look so original and creative! I can't wait to read them! Thanks for this amazing giveaway - I would love to win! 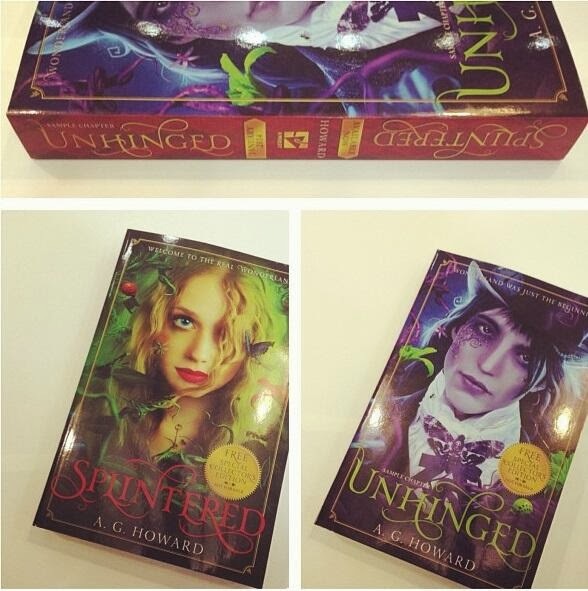 I really enjoyed Splintered, and have been really looking forward to reading Unhinged! I love the dark version of Alice in Wonderland! I was never a fan of Alice until I started finding all these twisted versions of it! I love the cover - it's so interesting! Thank you for joining this hop!! I like it that it is a flip book! Haven't seen one of those in a while. I absolutely adored Splintered! It is one of my favorite retelling's! I can't wait to read Unhinged. And what better way to do that than with a flip book?! I haven't seen a book like this since I was a little girl with a children's book. I love them, and the two covers together is just double the awesome! I love the fact that it's a retelling of Alice in Wonderland! Would it be bad if I said I ADORE the cover?